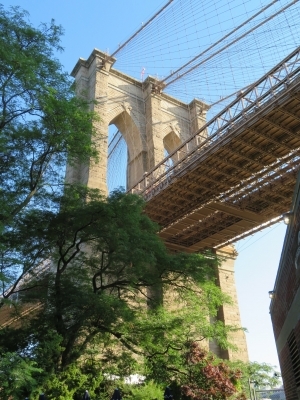 Brooklyn Bridge is part of the Tentative list of USA in order to qualify for inclusion in the World Heritage List. Among the industrial-age technological monuments, Brooklyn Bridge has few equals in terms of innovation and impact. When built, it was the longest suspension bridge in the world, and it employed techniques and materials that influenced bridge construction ever since. If it is ever inscribed on the WH list, Brooklyn Bridge for me will occupy a fairly unequalled position of a hometown site that I have visited uncounted times. My college alma mater is located at the foot of the bridge in the Lower Manhattan. In the decades of living in or around New York City, I have walked or driven by the bridge thousands of times, driven over it hundreds of times, and walked across it at least a dozen times. 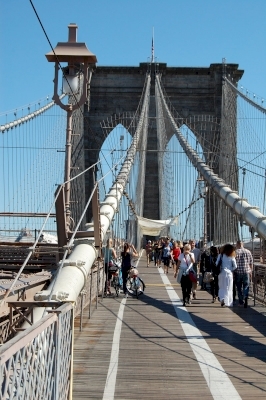 Walking across Brooklyn Bridge is obviously the best way to get acquainted with it. If you walk towards Manhattan, you are also looking at the incredible New York City skyline beyond its stone towers. The landings at the towers offer informative plaques on the history of the bridge construction and use. You can also enjoy gazing at the bridge from either side of the river, Brooklyn Bridge Park or South Street Seaport Pier 17. Completed and opened without the use of electricity, the Brooklyn Bridge was used primarily for horse-drawn carriage, pedestrians/bicycle, and railcar. It is an American icon and one of the most widely recognized modern monuments in the world. The Brooklyn Bridge should be visited in 3 ways, each is a reward worth your time. We can probably expect a nomination sometime around 2023. Which would be fitting to mark 140 years since the bridge opened. NYC really should have 3 or 4 world heritage sites, the fact that the Statue of Liberty is the only inscribed site within sight of NYC is unfortunate. Boy, oh boy, it's worldwide iconic presence aside, trying to get world heritage status for a structure that is constantly undergoing reconstruction, repairs and uncoordinated pedestrian, foot and car lane planning would be more difficult than getting to the Inaccessible Islands. I love the bridge, it still astounds me, and I walk or bicycle over it nearly ever day, year round, to get to work, but would this be a tough one. Don't worry, it gets more than enough visitors without the designation, the world knows it's here.